Hello! As a pastor, I’d like to know your view on plastic surgery, specifically on breast augmentation. Do you think it a sin to alter your body in such a way? Do you believe we offend God by it, as He created us “in his image”? Thanks in advance! Hey dear friend, I’m aware that not everyone will see eye-to-eye on this one and that there’s an immediate Christian reflex to answer a certain way – but I’d like to offer a few thoughts on this and to bring it together in the end. I hope you’ll hang with me, and I absolutely welcome disagreement and dialogue. As always, please feel free to skip around. 1) No one actually “needs” a make-over. On one hand, I hope we can really think through the ridiculous assertion that anyone needs plastic surgery or a changed appearance or even make-up and hair-dos, for any reason. Think of how crazy that is. No one should ever, ever, ever be quantified or qualified by how they look. But this is how we operate today. The modern merchandising of “beauty” has only exacerbated an aesthetic bias, and anyone who assumes they need plastic surgery is buying into a stream of Pavlovian-conditioned presumptions of image. If we take a huge step back from our tiny chronological prisons of culture and just snap out of everything we’ve been told, the modern urge for make-overs is a false manufactured choke-hold of ideas that has zero basis in reality. Simply, it’s silly. It’s sort of insane. The world’s concept of physical beauty does not determine the “goodness” of a person. How could it? I’m sure that sounds obvious and even pretentious – yet we’ve been so indoctrinated in the Lie of Appearance and the Idolatry of Youth that we’re conditioned to judge inherent value based on attraction. We tend to think good-looking people are “good people,” so we go way above our means to look “more attractive” to cover up a socially embedded insecurity. We’ve not only been trained to judge every book by its cover, but to outright dismiss and reject things the instant they don’t appeal to us. Bad-looking people must somehow be bad. Certainly we’re biologically wired to enjoy what’s “visually pleasing,” but it’s become so emphasized that we hate ugly things. We connect the visual to value. We’re all addicted to what we see. Even overly prizing someone’s talent or brains or winsome personality is still a false beauty paradigm. And no one is above this, including me. I hate to be so pushy about this, but your idea of beauty has been forced upon you by a long history of escalated objectification and perpetuated marketing. In other words, our ideas of beauty are not original. They’re brainwashed. They’ve been put there by a bombardment of specific, strategic market goals from those who want to control what makes a profit. I really don’t mean to sound like an alarmist or a conspiracy nut. In fact, the people who market this stuff aren’t all bad people; they just bought into the same stream of lies. It’s our natural tendency to create an “exclusive inner-ring” of insiders, and physical appearance is one more dividing line that fuels our urge for superiority. 2) Appearance is such an ingrained part of who we are that it can’t be ignored. The reality is: we inevitably care about how we look. On the other hand, I definitely understand why someone would want to change their appearance, whether it’s as drastic as plastic surgery or as simple as eye-liner. We can’t underestimate the power of self-image and self-regard, and though we shouldn’t primarily care about how others view us, we’ll inevitably care about how we view ourselves. My friend and I once watched a make-over show where a girl who had been called “ugly” her whole life was given free plastic surgery. She got implants, a new nose, liposuction, excess hair removal, and even an injection that would stop her from sweating for six months. In the final reveal, the girl and her entire family were crying and cheering and hugging to the appropriate dramatic music. The thing is, I do know what it does to a person. I’ve been called ugly for as long as I could remember, too. And I can tell you: it’s a huge, heavy burden to feel completely unattractive and undesirable. Unless you’ve been there, it’s impossible to understand how debilitating it is. I get why Michael Jackson had body dysmorphic disorder. I get why 10% of bullied teenagers have tried to commit suicide, and most of them were picked on for their appearance. A low self-regard provokes so many psychological distortions about who we are that it can take years of therapy to undo self-loathing about our face and body. Or it can take an entire surgical procedure. I certainly believe that no inherent dignity can be attributed to a person’s appearance. Yet I understand why it happens. It’s not necessarily because of what the world says, or even because of trauma or a disorder or deficiency. It’s because we each live with a world inside us. It’s a world of how we view ourselves, of how we regard our own worth, of how we talk to ourselves from the moment we wake to the thoughts crowding our sleep. And sometimes, a simple thing like an earring or new lipstick or a comb or a new pair of jeans can give us an extra confidence – and it’s not only harmless, but helpful. It somehow expresses how we want to feel inside, and in turn allows us to feel better about ourselves. I admit that at some point, it’s a first world problem. You won’t see plastic surgery advertised in an impoverished village. You don’t see too many third world people who dream of implants or tummy-tucks. But it’s incredible what a haircut and a shave can do for the homeless. And I can get behind reconstructive cosmetic surgery, whether it’s for trauma or a congenital condition. More specifically, I’m not sure any Christian woman needs breast augmentation. Again, if we take a step back and look at it truthfully from a historical reality: it’s a waste of time, money, and medical resources, and it’s a product of a false cultural narrative that we’ve been tricked into wholesale. But I also can’t judge any woman who decides to go for it. I would advise against it, but there are so many factors and variables that go into such a decision, that I cannot make a value judgment before or after. 3) God does want you to feel good about yourself (by knowing what is good). I know how “flesh-centered” this sounds: but really, who actually thinks God wants us to feel bad about ourselves? Maybe I shouldn’t ask. No, Christian: there’s nothing wrong with feeling good about yourself, so long as it comes from the right place and you hold it loosely with gratitude (1 Timothy 4:4, Philippians 4:8). God is a God of joy, not a God of somber, morose, self-punishment, as if this is humility. God ultimately empowers us towards a kind of self-forgetfulness, a humility that neither thinks too much or too little of ourselves, but is rooted first in how He thinks about us (1 Corinthians 3:21-4:7). There’s an order, a priority, a balance to how God operates in our lives. This means that even if you attempt to boost your own physical appearance, that you don’t really care about it, as a sort of foot-note to a joy you already have in Christ, and it isn’t for the sake of the world’s opinion or even your own. The Bible doesn’t automatically say, “Image bad, inside good.” The Bible doesn’t neglect outer-beauty, as if it were evil. The Bible instead prioritizes that our internal security comes before external image. In other words, our outside flows from our inside. The “sin” happens when we go the opposite direction or when we only look at the shallow surface. And even then, I think rather than “offending God,” our image-based culture grieves Him, because He’s trying to dig into why we would idolize our appearance. If we don’t dig at that first, then the true ugliness is inside, and there has to be a surgery of the spirit. 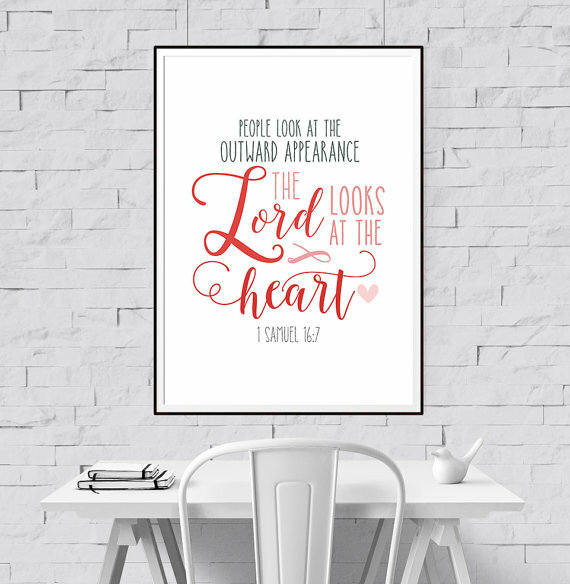 As a Christian, my go-to verse for appearance is 1 Samuel 16:7, which says, “The Lord does not look at the appearance, but the heart.” It smashes my every lie about image. Proverbs 31 also talks about the deceit of charm and vanity, 1 Peter 3:3-4 talks about inner-beauty, and James 2 talks about the danger of showing favoritism to those who look rich. Jesus himself was not considered an attractive person (Isaiah 53:2). But in conjunction with this, there are tons of instructions in the Old Testament about building a proper temple to God, particularly to the architect Bezalel and later King Solomon (Exodus 31, 1 Kings 6-7), because God demanded the highest aesthetic to reflect His beauty and goodness. That includes our physical world. It’s why Jesus connected so much joy with bread, wine, water, and dance (John 2). God calls us to excellence, both in worship and our character (Psalm 150, 2 Peter 1:5, Colossians 3:23-24, 2 Corinthians 8:7). This is the tension which we maintain, that beauty both inside and out is good when we know where it comes from and why. Most of the time it means we need to know that we are loved by God for who-we-are, and that He will do mighty work through a frail student like Timothy or a stutterer like Moses or a disabled man like Paul. But secondarily, I really believe it’s okay to have a beautified order outside us, since God Himself is an artist of glorious perfection. He is a God who works with taste, smell, rhythm, healing, and design, and He often communicated through angels who were so stunning that people fainted at their magnificence. If an angel can do that, then how much more with the one who made them? 4) It all comes down to motives. When it comes to plastic surgery or permanent changes in our body, I have to emphasize that our motives are extremely important. Not surprisingly, most peoples’ motives to get surgery are terrible. It’s not approached with any kind of thought or nuance, and it’s just falling into the assembly line of “image is power.” It’s either used to manipulate others for attention, or it’s to illegitimately repair an internal dysfunction that would be better handled with community and counseling. A significant number of people who undergo cosmetic surgery have underlying issues about their self-image which need confronting, and they’ve also been influenced by mass media. The amount of money that people spend on such things could go towards something better, like college or a business idea or groceries for the year. And changing appearance is not some magic trick that will cure our self-regard. People with plastic surgery are not significantly happier than anyone else, and in fact could diminish self-regard if there are unrealistic expectations. If someone approached me and asked, “What do you think if I got some work done?” – I would just as quickly ask, “Why?” I want to talk through it. As a Christian and a pastor and as your friend, I would press and challenge and dig deep. I would try to find alternatives. I would recommend the trifecta of health – right diet, sleep, and exercise – to improve a healthy self-image. But I also want to make room for an exception, and in the end, after a long time of deliberate reflection, if they truly decide that a surgical procedure will empower them, then it’s their decision. I will not shame them for it. Some of my own family members have had “work done.” I don’t think they needed it, but they wanted it all the same. I didn’t judge them before, and I didn’t judge them after. My only hope is that at the very bottom, when we’re stripped of our title and money and reputation, we’d find that our true worth is derived from Christ alone. We’ll all be a broken down bag of bones one day: and what will have mattered is that we first lived from the heart. This is what God sees, and it is what God alone can change. Previous Previous post: Let Your Religion. Next Next post: Like John or Like Judas. So many good things! I love the way you are able to look at things from multiple perspectives. As a middle class white Christian who grew up going to church, I really have to be intentional about doing that. It’s a really important thing, though, to be able to put myself in someone else’s shoes and to remind myself that if I were in the same situation, I might act the same way or worse. Additionally, when we’re able to consider another’s point of view, we’re able to actually listen and converse instead of just spitting our opinions at each other. Your writing does that – listens, considers, and converses, but always offers the truth in love. Anyway, 1 Samuel 16:7 is one of my favorite verses for when well-meaning Christians start hating on my tattoos. Thank you Suzanne! It feels like balancing on such a tightrope. Though I would never recommend any kind of external surgery/make-overs, I definitely understand the choice to do so and I could never judge someone who’s already gone through with it. The easy Christianese answer is to say “No way,” but there’s that murky reality in which people live, who either come to Christ later or have their own blessed convictions. By the way, I’ve wanted a tattoo for the longest time, but I always chicken out at the last second. Mostly it’s the needles. It takes quite a bit of courage to even consider getting one! The “murky reality in which people live” is left unacknowledged by too many Christians.. including me for way too long. Haha, tattoos definitely hurt and they are not for everyone. I think it takes a certain personality trait to want something on your skin forever and to trust someone else to put it there! If you do get one, I hope you share pictures! A few thoughts that I think should also be considered. Appearance paradigm? “Plastic” comes from the Greek plastikos which means to mold. We tend to wince at the idea of plastic surgery, but not as much to other shape-altering procedures. How many believers get braces? So, is it just the invasive nature of surgery that makes us draw the line? We don’t hesitate to look presentable with makeup and haircuts. Is plastic surgery avoided simply because of the risks? If so, what about other quality of life surgeries like knee and hip replacements? They have a much higher risk of death yet we treat them as a gift. I wonder what Paul would have said about his thorn in the side (was it a bad hip?). Treatment vs. Enhancement? Many people can get behind reconstructive surgery (e.g. cleft lip and palate surgeries) but balk at surgery to enhance something that isn’t “dis-eased.” This is a slippery slope argument. At what point does a birth defect become a normal attribute? You can live with a cleft lip and palate (but with significant functional problems). You can live with a large birthmark on your face (but often with significant psychological problems). It seems the first blush answer in this situation is an aesthetic of “normal;” if we are doing something to get you to “normal” it is ok but beyond that is vanity. What about ears that really stick out or a hump on your nose? Again, we enhance our appearance in other ways with makeup/clothes/haircuts. Hey Jared, thank you so much for your kindness and your thoughts. Re-reading the post, I wish I had done a better job of Point #3. I’d love to hear anything you want to add to these ideas as well. You asked some very important questions that need to be asked and confronted to eventually find a landing. I think both boundaries and freedom are important checks & balances, especially when it comes to unique scenarios. Every time I think I’ve “drawn the line” on something, I find another person who has a certain set of challenges that provokes me towards more thoughtfulness. Maybe the idea of Christian grace has a lot to do with adjusting our dials for individuals instead of one sweeping doctrinal dogma over an abstract paradigm. Would love to keep talking with you about this. I think a lot of the plastic surgery craze on our youth has to do with these kylie jenner like celebs who put a lot of pressure on girls who want to look like her and be like her when most of that isnt built but bought beauty.